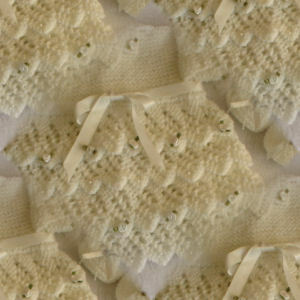 A GORGEOUS BABY OR REBORN LAYERS OF LACE DRESS AND SHOES DK KNITTING KNITTED IN DK THIS IS ONE OF THE ITEM THAT HAVE MATCHING ITEMS COAT, CAPE & BERET AND LAYERS OF LACE PRAM BLANKET, THIS COMPLETE SET LOOKS OUTSTANDING WHEN ALL THE ITEMS ARE TOGETHER, THE PATTERN FITS SIZE 16/18 CHEST OR 0/3MONTHS OR A 18/20 INCH DOLL! PLEASE CHECK OUT THE OTHER ITEMS IN THIS COLLECTION. 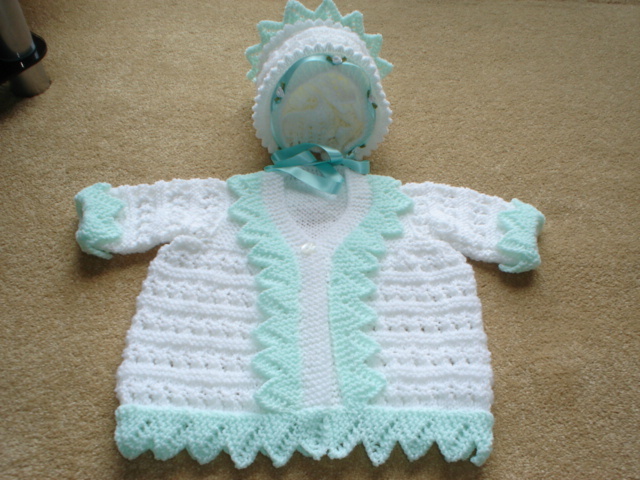 A CUTE LITTLE LAYERS OF LACE CAPE BABY OR REBORN DK KNITTING PATTERN WITH KNICKERBOCKER PANTS AND BERET, THE PATTERN FITS SIZE 16/18 CHEST OR 0/3MONTHS OR A 18/20 INCH DOLL! THIS SET IS BEAUTIFUL WHEN THEY ARE ALL PUT TOGETHER, THIS IS ONE OF THE ITEMS IN THE LAYERS OF LACE DESIGN. THIS IS ONE OF THE ITEMS IN THE LAYERS OF LACE DESIGN. 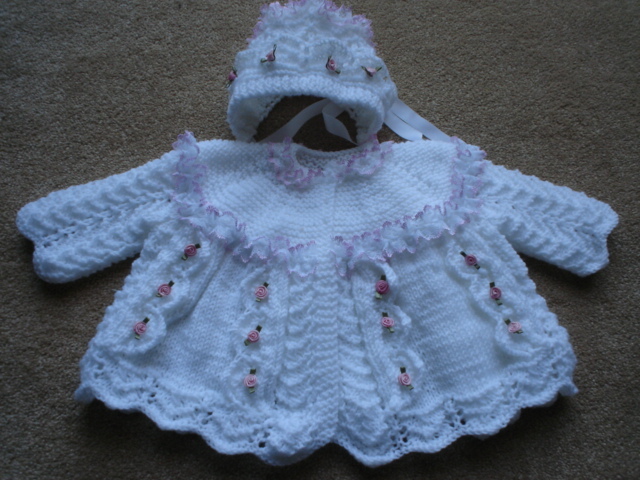 A BEAUTIFUL LACE AND BOWS DK KNITTING PATTERN THE PATTERN IS FOR A MATINEE COAT AND MATCHING BONNET, THE PATTERN FITS SIZE 16/18 CHEST OR 0/3MONTHS OR A 18/20 INCH DOLL! THE PATTERN IS MY OWN DESIGN AND CAN'T BE FOUND IN SHOPS, I HAVE MADE IT SO THE PATTERN IS VERY EASY TO FOLLOW , please don't copy my pattern but feel free to knit and sell the finished items. I ALSO HAVE THE DRESS AND SHOE PATTERN TO MATCH THIS COAT. THE PATTERN IS FOR A LACE & BOWS DRESS,SHOES AND PANTS,AND IS DONE IN DOUBLE KNIT, THE PATTERN FITS SIZE 16/18 CHEST OR 0/3MONTHS OR A 18/20 INCH DOLL! THE PATTERN IS MY OWN DESIGN AND CAN'T BE FOUND IN SHOPS,please don't copy my pattern but feel free to knit and sell the finished items. I ALSO HAVE THE COAT AND BONNET PATTERN TO MATCH. THIS IS FOR THE RIBBON AND ROSES COAT, BONNET, AND PANTS, THE PATTERN IS DONE IN DK & FITS SIZE 16/18 CHEST OR 0/3MONTHS OR A 18/20 INCH DOLL! ANY COLOURED RIBBON CAN BE ADDED TO THE COLOURS OF YOUR CHOICE,THE PATTERN IS MY OWN DESIGN AND CAN'T BE FOUND IN SHOPS, please don't copy my pattern but feel free to knit and sell the finished items.